Project BOM Articles is used to sum up bills of materials and is used as the foundation for reservations, inquiries and purchases. By summation of meter or square meter articles, the physical properties of articles must be considered before the actual number of articles required for stock reservation, inquiry or a purchase can be determined. The procedure is to set the Locked checkmark on a row and enter the number of articles in the Qty column. Total consumption is showed at the bottom of the BOM Lines tab and must be converted into property values on the Properties tab. 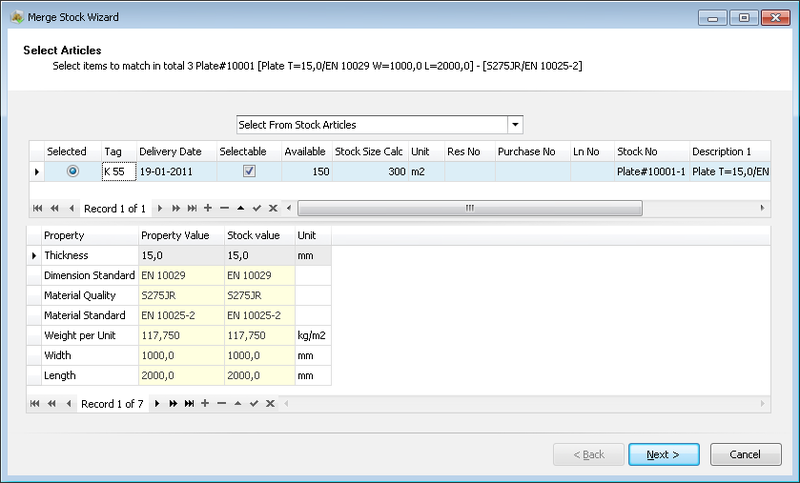 Once saved, the functions Merge Stock, Add Inquiry, Merge Purchase and Add Purchase are available. 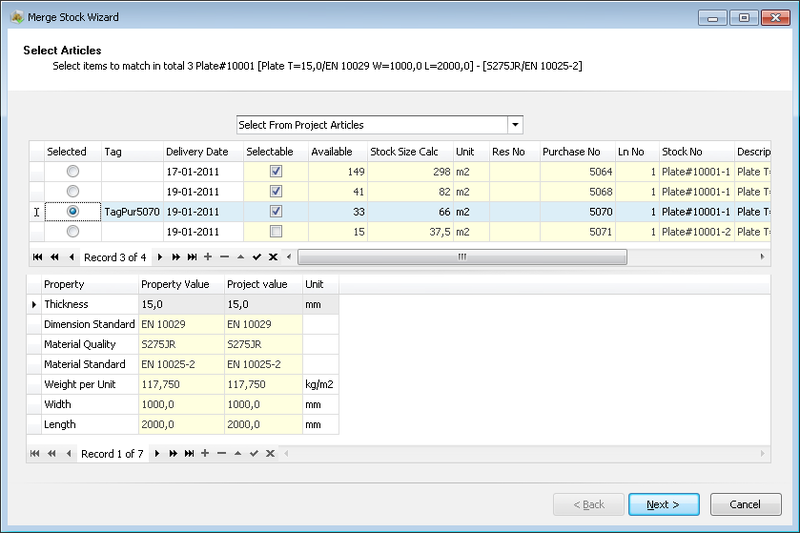 Actions shows shortcuts and functions in Project BOM Articles. Merge Stock: Is used to reserve articles from Stock or match the article to an article in the Project Articles module that has the status Reserved and Received or Purchased and Received. Merge Stock is a wizard, as shown below. On the first page, is has to be determined, if the article must be chosen from stock or the project stock by selecting either Select From Stock Articles or Select From Project Articles from the drop-down list at the top. - Selected: Used to select a single line, which is only possible is Selectable is checked. - Tag: Used to optionally tag the article for traceability. If the BOM line had a tag, this will be suggested by default, but can be overwritten. - Delivery Date: Used to set when the article has to be available on the project stock. By default today is suggested. - Selectable: Shows which articles can be selected. Only articles matching all properties can be selected; lines that do not have the same values on the property and stock value columns cannot be selected. - Available, Stock Size Calc, Unit, Stock No, Description 1, Description 2: Article information that cannot be edited. - Next and Finish will close the wizard and the article is now reserved from stock. - Selected: Used to select a line. Lines can only be selected, if Selectable is checked. - Tag, Delivery Date, Available, Stock Size Calc, Unit, Res No, Purchase No, Ln No, Stock No, Description 1, Description 2: Article information that cannot be edited. Remove Reservation: Is used to cancel an article reservation or an article attachment to an article in Project Articles. A stock reservation can only be cancelled, if the article is not yet moved to Project Articles via the Relocation module. If the article is already moved, it can be moved back to stock by de-selecting Picked in the Relocation module and can now be cancelled with the Remove Reservation function. Add Inquiry: It is possible to create an inquiry for all articles. The action Add Inquiry is a wizard. - Tag, Delivery Date, Available, Purchase No, Ln No, Qty Calc, Unit, Article No, Description 1 and Description 2: Article information that cannot be edited. - Next and Finish will close the wizard and the article is now matched to the article in Project Articles. - Select: Used to select a line. Lines can only be selected, if Selectable is checked. - Delivery Date: Used to set when the article must be available on the project stock. By default, today is suggested, but can be overwritten. - Article No, Qty, Description 1 and Description 2: Article information that cannot be edited. - Select Supplier: Supplier must be selected by activating a single line. 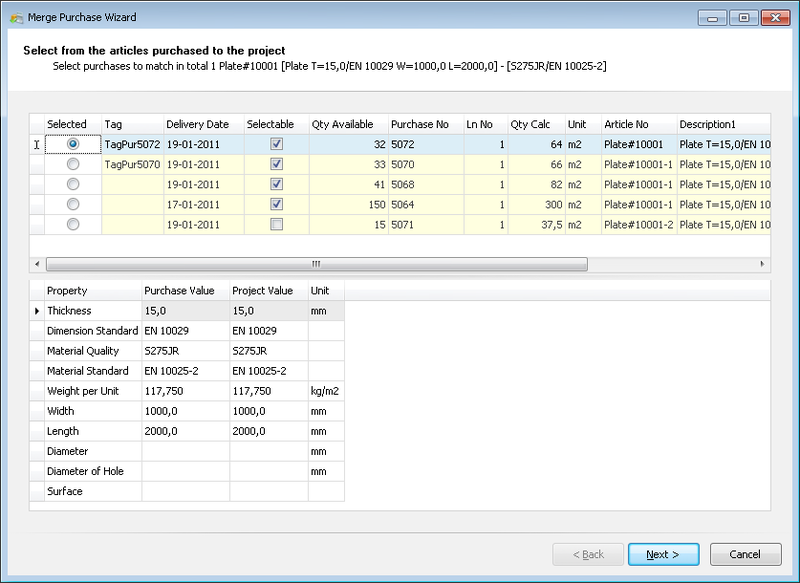 If there are existing purchases from the selected supplier that are still open, a list is shown. If no purchases are open, this page is automatically skipped and a new purchase is assumed. - Select purchase: The purchase must be selected by activating a single line. New Purchase must be selected to create a new purchase. 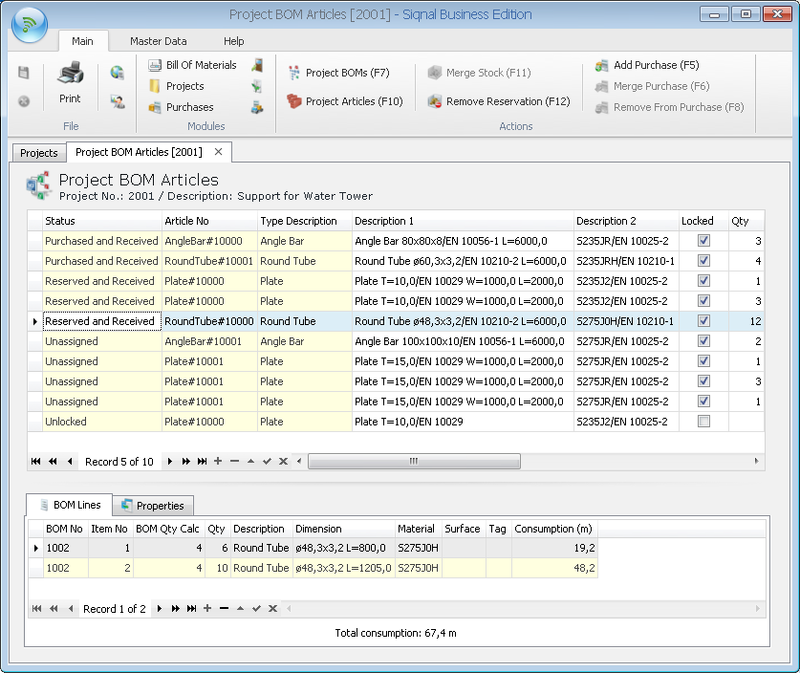 Remove From Purchase: Removes the attachment between the line in Project BOM Articles and Purchase. - Unlocked: The article is not yet processed. - Unassigned: The article is not yet reserved or purchased. - Purchased: The article is purchases or attached to a purchased item that has not yet been received. - Purchase and Received: The article is purchased and is now received through the Reception module. - Reserved: The article is reserved to a stock item. - Reserved and Received: The article is reserved and the article is now moved to the project stock through the Relocation module. Article No: Shows the article no from the Article Templates module. Type Description: Show the description of the article's type. Locked: Is set when an article is to be processed. The column Qty is now mandatory and dynamic properties must be filled in based on the rules from the Types module on the Properties tab. Setting Locked will also lock the BOM lines that are shown in the BOM Lines tab. Qty: The number of articles to be reserved or purchased. Inquiry No, Ln No, Purchase No, Ln No, Res No, Date, Delivery Date, Available Date, Location, Tag, Comments, Supplier, Contact and Phone: Information fields that cannot be edited. BOM Lines tab: Shows the BOM Lines from the module Project BOMs and calculates the total consumption per BOM Line: The Qty of the bom lines are multiplied and shown in the column BOM Qty Calc. BOM Qty Calc is then multiplied by the Qty column and shown in the column Consumption. The consumption is shown in pcs, meters or square meters. The total consumption for all BOM Lines is shown at the bottom. Properties tab: Used to enter dynamic properties and show static properties.